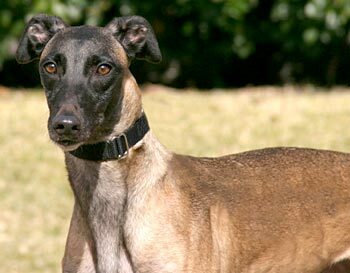 Maudie, aka CTW Legally Wed, is an almost 2-year-old fawn brindle female born April 13, 2007. Her sire is CTW Legendary, making her grand sire the famous Molotox, and her dam is CTW Don’t Forget, making her grand sire the famous Irish-bred Fortress. 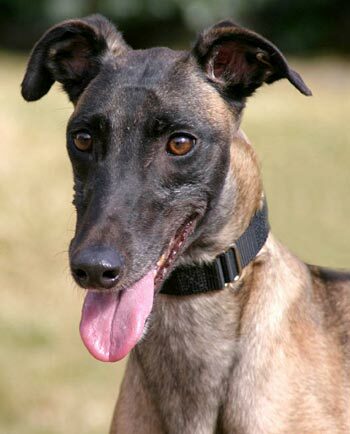 As you can see, Maudie has striking coloring and markings – she is fawn with black and a black face. Maudie suffered a central tarsal bone fracture of the right rear leg while schooling at Valley Race Park in Harlingen, TX on November 14, 2008. Her surgery for repair was performed on November 21, 2008, by Dr. Doug Lange of the Dallas Veterinary Surgery Center. Her leg is now healed and Maudie is being leash walked until February 10th at least. It is not known at this time if Maudie is small animal or cat tolerant.